Please check out MY INSTAGRAM ACCOUNT. Really? It smells like chocolate? It would be nice to see a flower like that. I saw on a cooking competition a herb that tastes like chocolate. Nature has the power to surprise. It smells like chocolate? I so need that planted on my writing porch! I love the texture in this photo! Exquisite photo - as was last week's. Thank you for sharing it with us at Photo Friday! This is one super awesome flower. Your great pics helps to show this flower at it's best. I want one. Amen to needing a bit of chocolate now and then--for me it's more like a lot of now and not so much then. The brown cosmos is very pretty! 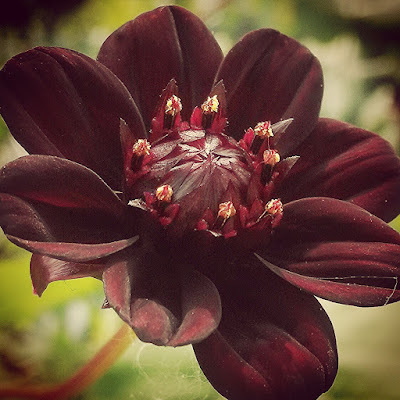 I've never heard of a flower that smells like chocolate but I sure would love to have some in my garden! What a wonderful post. wow its so pretty. i've never seen it. It's wonderful! Love the color! Beautiful and it smells like dark chocolate - wow. This is so pretty! And smells like chocolate?! I need to get me some of these! Thanks for joining the Cooking and Crafting with J & J! Beautiful flower, thanks for linking up!! I love your focus Friday!! Thanks for linking up on My 2 Favorite Things on Thursday Link Party!! Hope to see you again tomorrow!! Love partying with you!! Pinned!